The chairperson of the Nigeria Internet Governance Forum (NIGF) Multistakeholder Advisory Group (NIGF-MAG) and Managing Director of Abuja-based Jaeno Digital Solutions, Mrs. Mary Nma Uduma, has been nominated among the 56-members into the 2018 global Multistakeholder Advisory Group (MAG) of the Internet Governance Forum, reports ITRealms. IGF-MAG, ITRealms gathered, serves as a global multistakeholder platform that facilitates discussions of public policy issues pertaining to the Internet under the United Nations’ Department of Economic and Social Affairs (UNDESA). In a swift reaction, the Executive Director, Operations, DigitalSENSE Africa (DSA) Media, the organisers of the Nigeria DigitalSENSE Forum on Internet Governance for Development, an At-Large Structure, and member of NIGF-MAG, Mrs Nkem Nweke, applauded Mrs. Uduma’s appointment. “Congratulations Mrs. Uduma, this appointment is well-deserved and Nigeria needs to leverage on this by giving her all the support needed especially members of the NIGF-MAG. 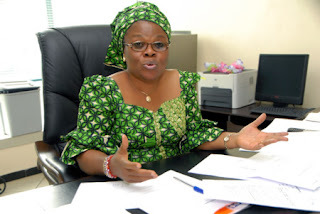 Her success is our success,” Nweke declared. ITRealms also reports that Mrs. Uduma, is the immediate past president of the Nigeria Internet Registration Association (NIRA) and was nominated to serve in the IGF-MAG 2018, as a member of the Technical Community for her first term. A press statement made available to ITRealms by the United Nations, proclaiming the development which included the renewal of the MAG and reappointment of the MAG chair, showed that Ms. St. Amour, Lynn of Boston, USA-based Internet Matters, and a member of technical community, has been reappointed for a third term as chair of MAG. Ms. Zumbado Munoz, Marcela (Government, 1 term) San Jose, Costa Rica – Officer, Permanent Mission of Costa Rica to the UN Office at Geneva. Pix: Mrs. Mary Uduma, courtesy, NCC.